Research conducted in the DIVA lab is targeted to biomedical and computational journals, conferences, and workshops. Biomedical publications focus on the results of visualization and analysis of biomedical data. Computational publications focus on the development and evaluation of algorithms and interfaces based on human-computer interaction principles. Beyond publications, our driving goal is to improve health in whatever form it takes. Bhavnani, S.K. *, Dang, B., Kilaru, V., Caro, M., Visweswaran, S., Saade, G., Parets, S.E., Smith, A.K., Menon, R. Methylation Differences Reveal Heterogeneity in Preterm Pathophysiology: Results from Bipartite Network Analyses. Journal of Perinatal Medicine (2018) 46(5), 509-521. Bhavnani, S.K. *, Andersen, C., Lin, Y-L., Santillana, E., Chen, T., Kuo, Y-F. The Role of Visual Analytics in Predictive Modeling. Proceedings of AMIA'2018 (in press). Bhavnani, S.K. *, Visweswaran, S., Divekar, R. Accelerating Innovation in Multidisciplinary Scientific Teams through Visual Analytics. Proceedings of Science of Team Science (SciTS) Conference'2018 (2018) [Outstanding Paper Award]. Bhavnani, S.K. *, Visweswaran, S. Exploring Visual Analytics as Boundary Objects in Multidisciplinary Science Teams. Proceedings of Science of Team Science (SciTS) Conference'2018 (2018). Bhavnani, S.K. *, Ameredes, B.T., Visweswaran, S. Team-Centered Informatics: Leveraging Team Science for Designing Effective Informatics Solutions. Proceedings of Science of Team Science (SciTS) Conference'2018 (2018). Warner, J.L., Rubinstein, S.M., Wu, Julie, Santillana, E., Chen, T., Bhavnani, S.K. Exploring Mutational Heterogeneity in the GENIE Tumor Database Using Visual Analytics. Proceedings of AMIA'2018 (2018). Bhavnani, S.K. *, Sellapan, R., Joshi, S., Starkey, J., Chan, W., Chen, T., Visweswaran, S. Utility of Visual Analytics for Identifying Patient Subgroups in EMRs: Insights for Accelerating Precision Medicine. Proceedings of AMIA'2018 (2018). Bhavnani, S.K. *, Lin, Y-L., Chenuri, L.R., Bores, J.M., Chen, T., Kuo, Y-F. Identification, Replication, Visualization and Interpretation of Patient Subgroups: Implications for Precision Medicine and Predictive Modeling. Proceedings of AMIA'2018 (2018). Bhavnani, S.K. *, Ayyaswamy, A., Chen, T., Visweswaran, S., Bellala, G., Bassler, K.E. Vicinity Exploration: Enabling User-Driven Visual Search of Multiple Machine Learning Models for Precision Medicine. Proceedings of AMIA'2017 (2017). Bhavnani, S.K. *, Ayyaswamy, A., Chen, T., Warner, J.L. Identification of Patient Subgroups in Metastatic Breast Cancer Patients Based on Somatic Copy Number Alterations: A Bipartite Network Analysis. Proceedings of AMIA'2017 (2017). Bhavnani S.K. *, Chen, T., Ayyaswamy, A., Visweswaran, S., Bellala, G. Enabling Comprehension of Patient Subgroups and Characteristics in Large Bipartite Networks: Implications for Precision Medicine. Proceedings of AMIA Summit on Translational Bioinformatics (2017). [Finalist for Marco Ramoni Distinguished Paper Award]. Madhavan, S.*, Ratwani, R., Warner, J., Bhavnani, S.K. Making Precision Oncology Data More Usable for Research and Care. Proceedings of AMIA Summit on Translational Bioinformatics (2017). Bhavnani, S.K. *, Dang, B., Visweswaran, S., Kevin E. Bassler, K.E., Chen, T., Raji, M., Divekar, R., Karmarkar, A., Tan, A., Kuo, Y-F, Ottenbacher, K. How High-Risk Comorbidities Co-occur in Readmitted Hip Fracture Patients: Implications for Precision Medicine and Predictive Modeling (in review). Bhavnani, S.K. *, Dang, B., Bellala, G., Divekar, R., Visweswaran, S., Brasier, A., Kurosky, A. Unlocking Proteomic Heterogeneity in Complex Diseases through Visual Analytics. Proteomics (2015) 15(8), 1405–1418. Tian, B., Xueling, L. Kalita, M., Widen, S.G., Yang, J., Bhavnani S.K., Dang, B, Kudlicki, A, Sinha, M., Kong, Fanping, K., Wood, T., Luxon, B., Brasier, A.R. * Analysis of the TGF B-induced program in primary airway epithelial cells shows essential role of NF-KB/RelA signaling network in type II epithelial mesenchymal transition. BMC Genomics (2015) 16:529, 1-23. Wooten, K., Calhoun, W., Bhavnani, S.K., Rose, R.M., Ameredes, B., Brasier, A.R. Evolution of Multidisciplinary Translational Teams (MTTs): Insights for Accelerating Translational Innovations. Clinical and Translational Science (2015). Bellala, G.*, Stanley, J., Bhavnani, S.K., and Scott, C. A Rank-based Approach to Active Diagnosis. IEEE Transactions on Pattern Analysis and Machine Intelligence (2013) 35(9):2078-90. Bhavnani, S.K. *, Bellala, G., Victor, S., Bassler, K., Visweswaran, S. The Role of Complementary Bipartite Visual Analytical Representations in the Analysis of SNPs: A Case Study in Ancestral Informative Markers. Journal of the American Medical Informatics Association (2012) 19:e5-e12 [News]. Bhavnani, S.K. *, Warden, M., Zheng, K., Hill, M., Athey, B.D. Researchers' Needs for Resource Discovery and Collaboration Tools: A Qualitative Investigation of Translational Scientists. Journal of Medical Internet Research (2012) 14(3):e75. Finnerty, C.*, Ju, H., Spratt, H., Victor, S., Jeschke, M., Hegde, S., Bhavnani, S.K., Luxon, B. A., Brasier, A., Herndon, D. Proteomics Improves the Prediction of Burns Mortality: Results from Regression Spline Modeling. Clinical and Translational Science (2012) 5(3), 243-249. Calhoun, W.J., Wooten, K., Bhavnani, S.K., Anderson, K.E., Freemain, M.J., Brasier, A.R. * The CTSA as an Exemplar Framework for Developing Multidisciplinary Translational Teams. Clinical and Translational Science (2013) 6(1):60-71. Pillai, R. R., Divekar, R., Brasier A.R., Bhavnani, S.K., Calhoun, W.J. * Strategies for molecular classification of asthma using bipartite network analysis of cytokine expression. Current Allergy and Asthma Reports (2012) 12(5):388-95. Bellala, G.*, Bhavnani, S.K., and Scott, C. Group-Based Query Learning for Rapid Diagnosis in Time-Critical Situations. IEEE Transactions on Information Theory (2012) 58(3):1. Bhavnani, S.K. *, Victor, S., Calhoun W. J., Busse, W. W., Bleecker, E., Castro, M., Ju, H., Brasier, A. R. How Cytokines Co-occur across Asthma Patients: From Bipartite Network Analysis to a Molecular-Based Classification. Journal of Biomedical Informatics, 44 (2011) S24–S30. Bhavnani, S.K. *, Arunkumaar G., Hall, T., Maslowski, E., Martini, S., Eichinger, F., Martini, S., Saxman, P., and Kretzler, M. Discovering Hidden Relationships between Renal Diseases and Regulated Genes through 3D Network Visualizations. BMC Research Notes, 3, 296 (2010). Bhavnani, S.K. *, Bellala, G., Ganesan, A., Krishna, R., Saxman, P., Scott, C., Silveira, M., and Given, C. The Nested Structure of Cancer Symptoms: Implications for Analyzing Co-occurrence and Managing Symptoms. Methods of Information in Medicine, 49,6 (2010), 581-591. [originally published as an abstract in AMIA'09, and selected as Journal Potential]. Bhavnani, S.K. *, and Peck, F.A. Scatter Matters: Regularities and Implications for the Scatter of Healthcare Information on the Web. Journal of the American Society for Information Science and Technology 61,4 (2010), 659–676. Bhavnani, S.K. *, Eichinger, F., Martini, S., Saxman, P., H.V. Jagdish, and Kretzler, M. Network Analysis of Genes Regulated in Renal Diseases: Implications for a Molecular-Based Classification. BMC Bioinformatics 10(Suppl 9):S3 (2009). [Outstanding Paper, 2009 AMIA Summit on Translational Bioinformatics]. Bhavnani, S.K. *, Peck, F.A., and Reif, F. Strategy-Based Instruction: Lessons Learned in Teaching the Effective and Efficient Use of Computer Applications. ACM Transactions on Computer-Human Interaction 15,1 (2008), 2:1-2:43. [Invited presentation at ACM CHI 2009]. Adamic, L.A.*, Bhavnani, S.K., and Xiaolin, S. Scatter Networks: A New Approach for Analyzing Information Scatter on the Web. New Journal of Physics (Special Issue on Complex Systems) 9 (2007) 231. Bhavnani, S.K. *, Bichakjian, C.K., Johnson, T.M., Little, R.J., Peck, F.A., Schwartz, J.L., and Strecher, V.J. Strategy Hubs: Domain Portals to Help Find Comprehensive Information. Journal of the American Society for Information Science and Technology 57, 1 (2006), 4-24. Schlosser, R.W. *, Wendt, O., Bhavnani, S.K., and Nail-Chiwetalu, B. Use of Information Seeking Strategies in Evidence-Based Practice: The Case of Pearl Growing. International Journal of Language and Communication Disorders 41, 5 (2006), 567–582. Bhavnani, S.K. * The Retrieval of Highly Scattered Facts and Architectural Images: Strategies for Search and Design. Automation in Construction 14 (2005), 724-735. Bhavnani, S.K. * Why is it Difficult to Find Comprehensive Information? Implications of Information Scatter for Search and Design. Journal of the American Society for Information Science and Technology 56, 9 (2005), 989-1003. Bhavnani, S.K. *, and John, B.E. The Strategic Use of Complex Computer Systems. Human-Computer Interaction 15 (2000), 107-137. Flemming, U. *, Bhavnani, S.K., and John, B.E. Mismatched Metaphor: User vs. System Model in Computer-Aided Drafting. Design Studies 18 (1997), 349-368. Bhavnani, S.K. *, Flemming, U., Forsythe, D.E., Garrett, J.H., Shaw, D.S., and Tsai, A. CAD Usage in an Architectural Office: From Observations to Active Assistance. Automation in Construction 5 (1996), 243-255. Bhavnani, S.K. *, Peck, F.A., and Reif, F. Strategy-Based Instruction: Lessons Learned in Teaching the Effective and Efficient Use of Computer Applications. TOCHI article invited for presentation at ACM CHI 2009. Bhavnani, S.K. *, Bichakjian, C.K., Johnson, T.M., Little, R.J., Peck, F.A., Schwartz, J.L., and Strecher, V.J. Strategy Hubs: Next-Generation Domain Portals with Search Procedures. Proceedings of CHI'03 (2003), 393-400. Bhavnani, S.K. *, Reif, F. and John, B.E. Beyond Command Knowledge: Identifying and Teaching Strategic Knowledge for Using Complex Computer Applications. Proceedings of CHI' 01 (2001), 229-236. Bhavnani, S.K. *, John, B.E., and Flemming, U. The Strategic Use of CAD: An Empirically Inspired, Theory-Based Course. Proceedings of CHI'99 (1999), 42-49. Bhavnani, S.K. *, and John, B.E. Delegation and Circumvention: Two Faces of Efficiency. Proceedings of CHI'98 (1998), 273-280. Bhavnani, S.K. *, and John, B.E. From Sufficient to Efficient Usage: An Analysis of Strategic Knowledge. Proceedings of CHI'97 (1997), 91-98. Bhavnani, S.K. *, and John, B.E. Exploring the Unrealized Potential of Computer-Aided Drafting. Proceedings of CHI'96 (1996), 332-339. Bhavnani, S.K. *, Abbas, M., McMicken, V., Oezguen, N., Tupa, J. iCircos: Visual Analytics for Translational Bioinformatics. Proceedings of ACM International Health Informatics Symposium, IHI'2012 (2012). Bhavnani, S.K. *, Jacob, R.T., Nardine, J., and Peck, F.A. Exploring the Distribution of Online Healthcare Information. Proceedings of CHI'03 (2003), 816-817. Bhavnani, S.K. *, Clarkson, G., and Scholl, M. Search and Sensemaking of Patents. Extended Abstracts Proceedings of ACM CHI'08 (2008), 2799-2804. Bhavnani, S.K. * Domain-Specific Search Strategies for the Effective Retrieval of Healthcare and Shopping Information. Extended Abstracts Proceedings of CHI'02 (2002), 610-611. Bhavnani, S.K. * Strategic Approach to Computer Literacy. Extended Abstracts Proceedings of CHI'00 (2000a), 161-162. Bhavnani, S.K. *, Dang, B., Visweswaran, S., Divekar, R., Tan, A., Karmarkar, A., Ottenbacher K. How Comorbidities Co-Occur in Readmitted Hip Fracture Patients: From Bipartite Networks to Insights for Post-Discharge Planning. Proceedings of AMIA Summit on Clinical Research Informatics (2015). Bhavnani, S.K. *, Dang, B, Caro, M., Bellala, G., Visweswaran, S. Heterogeneity within and across Pediatric Pulmonary Infections: From Bipartite Networks to At-Risk Subphenotypes. Proceedings of AMIA Summit on Translational Bioinformatics (2014). Bhavnani S.K. *, Drake, J.A., Bellala, G., Dang, B., Peng, B., Oteo, J.A., Santibañez-Saenz, P., Visweswaran, S., Olano, J.P. How Cytokines Co-occur across Rickettsioses Patients: From Bipartite Visual Analytics to Mechanistic Inferences of a Cytokine Storm. Proceedings of AMIA Summit on Translational Bioinformatics (2013) [Distinguished Paper Award]. Bhavnani, S.K. *, Chavan, A.L., Jain, I., Maroo, S. How Can a Computer be Useful to You? A Feasibility Study to Elicit Perceptions of Computers in Rural India. Proceedings of AMIA’11. Bhavnani, S.K. *, Victor, S., Calhoun W. J., Busse, W. W., Bleecker, E., Castro, M., Ju, H., Brasier, A. R. How Cytokines Co-occur across Asthma Patients: From Bipartite Network Analysis to a Molecular-Based Classification. Proceedings of AMIA Summit on Translational Bioinformatics (2011) [Distinguished Paper Award]. Bhavnani, S.K. *, Carini, S., Ross, J., and Sim, I. Network Analysis of Clinical Trials on Depression: Implications for Comparative Effectiveness Research. Proceedings of AMIA’10, (2010). Bhavnani, S.K. *, Eichinger, F., Martini, S., Saxman, P., and Kretzler, M. Network Analysis of Genes Regulated in Renal Diseases: Implications for a Molecular-Based Classification. Proceedings of 2009 AMIA Summit on Translational Bioinformatics (2009). [Outstanding Paper Award]. Bhavnani, S.K. *, Abraham, A., Demeniuk, C., Gebrekristos, M., Gong, A., Nainwal, S., Vallabha, G.K., and Richardson, R.J. Network Analysis of Toxic Chemicals and Symptoms: Implications for Designing First-Responder Systems. Proceedings of AMIA’07 (2007), 51-55. [Distinguished Paper Award]. Bhavnani, S.K. * The Distribution of Online Healthcare Information: A Case Study on Melanoma. Proceedings of AMIA’03 (2003), 81-85. Bhavnani, S.K. *, Bichakjian, C.K., Schwartz, J.L., Strecher, V.J., Dunn, R.L., Johnson, T.M., and Lu, X. Getting Patients to the Right Healthcare Sources: From Real-world Questions to Strategy Hubs. Proceedings of AMIA'2002 (2002), 51-55. Bhavnani, S.K. *, Sellapan, R., Joshi, S., Starkey, J., Chan, W., Chen, T., Visweswaran, S. Utility of Visual Analytics for Identifying Patient Subgroups in EMRs: Insights for Accelerating Precision Medicine. Proceedings of AMIA'2018 (in press). Bhavnani S.K. *, Ayyaswamy, A., Chen, T., Visweswaran, S., Bellala, G., Bassler, K.E. Vicinity Exploration: Enabling User-Driven Visual Search of Multiple Machine Learning Models for Precision Medicine. Proceedings of AMIA'2017 (2017). Bhavnani S.K. *, Ayyaswamy, A., Chen, T., Warner, J.L. Identification of Patient Subgroups in Metastatic Breast Cancer Patients Based on Somatic Copy Number Alterations: A Bipartite Network Analysis. Proceedings of AMIA'2017 (2017). Dang, B., Mathew, J., Chen, T., Bhavnani S.K. * ExplodeLayout: Comprehending Patient Subgroups in Large Networks. Proceedings of AMIA'2016. Bhavnani, S.K. *, Dang, B., Chen, T., Bassler, K.E., Divekar, R., Visweswaran, S. Replicability of Co-occurring Comorbidities: Implications for Precision Medicine. Proceedings of AMIA Summit on Translational Bioinformatics (2016). Dang, B., Chen, T., Bassler, K.E., Bhavnani S.K. * ExplodeLayout: Enhancing the Comprehension of Large and Dense Networks. Proceedings of AMIA Summit on Translational Bioinformatics (2016). Bhavnani, S.K. *, Visweswaran, S., Divekar, R., Bellala, G. Where is the Science in Big Data Visual Analytics? From Pretty Pictures to Transformative Biomedical Discoveries. Proceedings of AMIA Summit on Clinical Research Informatics (2015). Bhavnani, S.K. *, Dang, B., Visweswaran, S., Divekar, R. Inter-Network Cluster Replication: A Case Study in Co-Occurring Comorbidities. Proceedings of AMIA Summit on Translational Bioinformatics (2015). Dang, B.S., Bhavnani S.K. * Pajekto3DStereo: Enabling Generation and Interaction with 3D Stereo Networks. Proceedings of AMIA (2014). Dang, B., Visweswaran, S., Mejias, A., Divekar, R., Bhavnani, S.K. * Revealing Heterogeneity in Gene Regulation through Network Edge Coloring: A Case Study in Pediatric Pulmonary Infections. Proceedings of AMIA Summit on Translational Bioinformatics (2014). Bhavnani, S.K. *, Dang, B., Caro, M., Menon, R. How Bipartite Network Visualizations Complement Ingenuity Pathway Analysis: A Case Study in Methylation Related to Preterm Births. Proceedings of AMIA Summit on Translational Bioinformatics (2014). Caro, M., Dang, B., Bedoya, G., Bhavnani, S.K. * Population-Specific Manifestation of Insulin Signaling/Action Pathways: A Case Study of Chronic Metabolic Diseases in Colombians. Proceedings of AMIA Summit on Translational Bioinformatics (2014). Bhavnani, S.K. *, Dang, B., Divekar, R.D. Accelerating Translational Insights through Visual Analytics (State of the Practice). Proceedings of AMIA (2013). Bhavnani, S.K. *, Dang, B., Zheng, K., Weber, C. How First Responders Use Decision-Support Tools during Chemical Emergencies: The Nexus of Culture, Context, and Cognition. Proceedings of AMIA (2013). Bhavnani, S.K. *, Drake, J., Dang, B., Visweswaran, S., Olano, J.P. Comprehension of Multiple Molecular Pathways using 3D Networks. Proceedings of AMIA Summit on Translational Bioinformatics (2013). Dang, B., Drake, J.A., Bellala, G., Bhavnani, S.K. * From Genes to Pathways and Back Again: A Visual Analytical Approach. Proceedings of AMIA Summit on Translational Bioinformatics (2013). Bhavnani, S.K. *, Drake, J.A., Dang, B., Visweswaran, S. Outlier Detection through Bipartite Visual Analytics. Proceedings of AMIA Summit on Translational Bioinformatics (2013). Bhavnani, S.K. *, Dang, B., Drake, J.A., Bellala, G., Olano, J.P. How Complimentary Bipartite Visual Analytical Representations Reveal Patterns in Cytokine Expression: A Case Study in Rickettsioses. Proceedings of AMIA Summit on Translational Bioinformatics (2013). Bhavnani, S.K. *, Calhoun, W., Brasier, A.R. Exploring the Role of Visual Analytics in the Design and Management of Multidisciplinary Translational Teams Proceedings of AMIA’12 (2012). Bhavnani, S.K. *, McMicken, V., Divekar, R. Visual Analytics for Accelerating Discoveries in Translational Science Proceedings of AMIA’12 (2012). Bhavnani, S.K. *, Massey, M., Michaud-Hanson, E., Zheng, K., Weber, C. Decision-Support in the Wild: A Qualitative Study on How First Responders Use Technology for Rapidly Identifying Toxic Chemicals Proceedings of AMIA’12 (2012). [Distinguished Poster Award]. Divekar, R.D., Pillai, R., Calhoun, W.J., Bhavnani, S.K. * Asthma Internet Searching: A Surveillance and Rapid Response Opportunity? Proceedings of AMIA Summit on Translational Bioinformatics (2012). Bhavnani, S.K. *, Farroni, J. S., Crowder, J., McKinney, B., Pillai, R., Calhoun W. J., Rose, R.M. Carter, M.A. The Role of Method Intuition in Translational Ethics. Proceedings of AMIA Summit on Translational Bioinformatics (2012). Wong, A.K. *, Bhavnani, S.K., Visweswaran, S. Genetic Variations Associated with Age-of-Onset of Alzheimer's Disease. Proceedings of AMIA Summit on Translational Bioinformatics (2012). Bhavnani, S.K. *, Bassler, K., Sarkar, I.N., Gundlapalli, A.V., Shaikh A. Can Network Visualization and Analysis Accelerate Medical Discoveries? Theoretical, Applied, and Funding Perspectives. Proceedings of AMIA’11. Bhavnani, S.K. *, Ganesan, A., Weber, C. Rapid Identification of Toxic Chemicals during Emergencies: Integrating Search with Visual Analytics. Proceedings of AMIA’11. Bhavnani, S.K. *, Pillai, R., Calhoun W. J., Brasier, A. R. How Circos Ideograms Complement Networks: A Case Study in Asthma. Proceedings of AMIA Summit on Translational Bioinformatics (2011). Bhavnani, S.K. *, Victor, S., Eswaran, H., Govindan, R.B. Network Visualization and Analysis of Pregnant Uterine Contractions. Proceedings of AMIA Summit on Translational Bioinformatics (2011). Bhavnani, S.K. *, Ganesan, A., Hall, T., Maslowski, E., Eichinger, F., Martini, S., Saxman, P., Scott, C., Kretzler, M. Exploring the Use of 3D Layouts to Analyze Disease-Gene Networks. Proceedings of AMIA Summit on Translational Bioinformatics (2010). Bhavnani, S.K. *, Bellala, G., Ganesan, A., Krishna, R., Saxman, P., Scott, C., Silveira, M., and Given, C. Network Analysis of Cancer Patients and Symptoms: Implications for Symptom Management and Treatment. Proceedings of AMIA’09 (2009). (abstract selected as Journal Potential and accepted for publication in Methods of Information in Medicine). Bhavnani, S.K. *, Ganesan, A., Scott, C., Weber, C., and Saxman, P. A Novel System for Rapidly Identifying Toxic Chemicals. Proceedings of AMIA’08. Bhavnani, S.K. *, Saxman, P.R., Hunscher, D.A., Zheng, K., Smith, K.A., and Athey, B.D. CaTER: University of Michigan's Web Portal for Clinical and Translational Empowered Research. Proceedings of 2008 AMIA Summit on Translational Bioinformatics. Bhavnani S.K. * Visual Analytics: Leveraging Cognitive Principles to Accelerate Biomedical Discoveries. In Cognitive Informatics for Biomedicine (ed. V. Patel, T. Kannampallil and D. Kaufman). Springer (2015) 307-330. Bhavnani S.K. *, Drake, J.A., Divekar, R. The role of visual analytics in asthma phenotyping and biomarker discovery. In Heterogeneity in Asthma. (ed. A. Brasier), Springer, (2014) 289-305. Bhavnani, S.K. *, and Wilson, C. Information Scattering. Encyclopedia of Library and Information Science (2010) 2564-2569. Bhavnani, S.K. * Application Use Strategies. Berkshire Encyclopedia of Human-Computer Interaction (ed. W.S. Bainbridge), 2004a, 32-37. Bhavnani, S.K. * A Personal Story -- Internet Singing Lessons. (side bar) Berkshire Encyclopedia of Human-Computer Interaction (ed. W.S. Bainbridge), 2004b, 119. Bhavnani, S.K. *, and John, B.E. The Strategic Use of Complex Computer Systems. Human-Computer Interaction in the New Millennium (ed. John Carroll), 2001, 97-124. Bhavnani, S.K. *, Dang, B., Kilaru, V., Caro, M., Saade, G., Smith, A., Menon, R. Methylation Differences Reveal Heterogeneity in Spontaneous Preterm Birth Pathophysiology: A Visual Analytical Approach. Proceedings of the Society for Maternal Fetal Medicine (2014). Bhavnani, S.K. *, Dang, B., Caro, M., Saade, G., Visweswaran, S., Menon, R. Genetic Differences Reveal Heterogeneity in Spontaneous Preterm Birth Pathophysiology: A Visual Analytical Approach. Proceedings of the Society for Maternal Fetal Medicine (2014). Bhavnani, S.K. *, Dang, B., Zheng, K., Weber, C. Perceived Usefulness and Usability of a Visual Analytical System for Toxic Chemical Identification: Results from a National Survey of First Responders. Proceedings of Visual Analytics Workshop (2013). Bellala, G.*, Stanley, J., Scott, C., and Bhavnani, S.K. Active Diagnosis via AUC Maximization: An Efficient Approach for Multiple-Fault Identification in Large Scale, Noisy Networks. Proceedings of Uncertainty in Artificial Intelligence (2011). Bellala, G.*, Bhavnani, S.K., and Scott, C. Active Diagnosis under Persistent Noise with Unknown Noise Distribution: A Rank-Based Approach. Proceedings of AI & Statistics (2011). Bellala, G.*, Bhavnani, S.K., and Scott, C. Extensions of Generalized Binary Search to Group Identification and Exponential Costs. Proceedings of Neural Information Processing Systems (2010). Bhavnani, S.K. *, Newman, M.W., Veinot, T., and Zheng, K. The Role of HCI in Translational and Clinical Science: Untapped Opportunities for Broad Social Impact. Human-Computer Interaction Consortium Workshop (2009). Martini, S., Bhavnani, S.K., Eichinger, F., Saxman, P., Cohen, C., Kretzler, M.*, and the European Renal cDNA Bank Consortium. Defining the molecular network of renal diseases: Genome-wide mRNA profiles identify molecular relationships in eight renal diseases. Renal Week (2008): American Society of Nephrology (ASN) Annual Meeting. Bhavnani, S.K. *, Ganesan, A., Weber, C., Banas, S., Saxman, P. A System for the Rapid Identification of Toxic Chemicals in HazMat Vehicles. Michigan World Usability Day Conference, 2008. [Top Poster Award]. Bhavnani, S.K. *, and Adamic, L.A. Making Sense of Information Scatter on the Web. HCIC 2007 (2007). Bhavnani, S.K. *, and Peck, F.A. Towards a Model of Information Scatter: Implications for Search and Design. Proceedings of ASIST'2006 (2006). Bhavnani, S.K. * How to Facilitate Effective Computer Use? The Interaction of Task Complexity and Tool Sophistication. Proceedings of Designing Information and Organizations with a Positive Lens (online position paper, 2005). Bhavnani, S.K. * Crossing the Line: Opportunities and Challenges of Interdisciplinary Research by Untenured Researchers. Proceedings of The First i-Conference of the i-School Community: Bridging Disciplines to Confront Grand Challenges (online position paper, 2005). Bhavnani, S.K. * Emergent Web Regularities: Implications for Research and Education in i-Schools. Proceedings of The First i-Conference of the i-School Community: Bridging Disciplines to Confront Grand Challenges (online position paper, 2005). Peck, F.A. *, Bhavnani, S.K., Blackmon, M.H., and Radev, D.R. Exploring the use of natural language systems for fact identification: Towards the automatic construction of healthcare portals. Proceedings of ASIST'2004, 327-338. Bhavnani, S.K. * The retrieval of highly scattered facts and architectural images: Strategies for search and design. G-CADS'2004 (2004). Bhavnani, S.K. *, and Bates, M.J. Separating the Knowledge Layers: Cognitive Analysis of Search Knowledge Through Hierarchical Goal Decompositions. Proceedings of the ASIST'2002 (2002), 204-213. Bhavnani, S.K. * Important Cognitive Components of Domain-Specific Search Knowledge. Proceedings of TREC'2001 (2001), 571-578. Bhavnani, S.K. *, Drabenstott, K., and Radev, D. Towards a Unified Framework of IR Tasks and Strategies. Proceedings of ASIST'2001 (2001), 340-354. Bhavnani, S.K. *, Drabenstott, K., and Athota, S. General and Efficient Strategies for Information Retrieval. Proceedings of ASIST'2001 (2001), 680-681. Bhavnani, S.K. * Designs Conducive to the Use of Efficient Strategies. Proceedings of DIS'00, (2000b), 338- 345. Bhavnani, S. K.*, Garrett, J.H., Flemming, U., and Shaw, D.S. Towards Active Assistance. Bridging the Generations. The Future of Computer-Aided Engineering (eds. J. H. Garrett and D. R. Rehak) Department of Civil and Environmental Engineering, Carnegie Mellon University, Pittsburgh, PA (1999), 199-203. Bhavnani, S.K. *, Flemming, U., Forsythe, D.E., Garrett, J.H., and Shaw, D.S. Understanding and Assisting CAD Users in the Real World. Proceedings of ACADIA'95 (1995), 209-227. Bhavnani, S.K. *, Garrett, J.H., and Shaw, D.S. Leading Indicators of CAD Experience. Proceedings of CAAD Futures'93 (1993), 313-334. Shaw, D.S. *, Yang, D., Garrett, J.H., and Bhavnani, S.K. Identifying CAD Objects and Behaviors as a Means of Adapting to Designers. Proceedings of the 21st Annual Conference on Computer Science, CSC'93 (1993), 278-283. Bhavnani, S.K. * Expert CAD Systems: What’s the Problem? Proceedings of the Annual Conference of the International Association of Knowledge Engineers, IAKE’89 (1989), 436-441. Bhavnani, S.K. * Learning FEA by Computer. Computer-Aided Engineering (May 1991), 72-73. Bhavnani, S.K. * I/ExperTutor: Bridging the Experience Gap. Intervue, Intergraph Year Book (Winter 1990), 26-30, v. 10, no. 1. Moore, N.C. How best to exploit the power of popular computer programs (appeared on the home page of the University of Michigan, and features a description of the strategies to use complex computer applications). University of Michigan News Service (April 1, 2009). Arun Ganesan's interdisciplinary undergraduate research project leads to two awards (appeared on the home page of the EECS department, and features a description of the UROP awards by Ganesan and Bhavnani). EECS News and Announcements (May 27, 2008). Applause! Bhavnani and team win distinguished paper award (features a description of the AMIA paper that won the distinguished paper award) Applause! (January 2008). Khalil, H. Ann Arbor woman 90, casts first ballot as naturalized citizen (features an interview with Neel and Suresh Bhavnani on voting for Obama). The Ann Arbor News (November 4, 2008). Aisner, A., and Carolin, L. New Citizens Leave Past Behind: 300 pledge for 1st time as Americans. (features an interview with Neel and Suresh Bhavnani on the process of US naturalization). 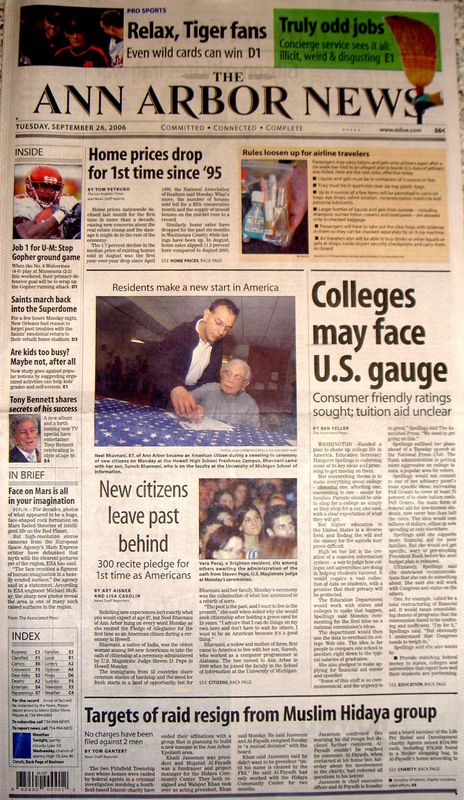 The Ann Arbor News, (September 6, 2006), Pg 1. Detailed Image, Full Text. Jackson, J. SI students' projects among top GROCS contest winners (features Bhavnani’s students who won a GROCS award for GoogleBuddy). SI website (Fall 2005). Ganguly, D. Bhavnani Hits the Bullseye (features Bhavnani's career trajectory and research findings). Economic Times (July 9, 2004). Jackson, J. Search Party: Professors' Strategies Make Finding Information Easier (features an interview with Marcia Bates and Suresh Bhavnani). SI@umich (Fall 2002), 7. Lossing, D., and Powell, M.S. 2001 Michigan Road Scholar’s Movie (features interviews with Michigan Road Scholars including Suresh K. Bhavnani). Audio from Michigan Public Radio, video from Michigan Road Scholars (May 4, 2001). Bhavnani, S.K. The Problem at Despandu. Artifax (Fall, 1996), 6-7. Bhavnani, S.K., and Dang, B. Mukhi House Diaries.